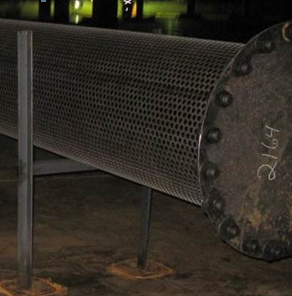 The ATT Tank Gas Inlet Diffusers are installed on tanks equipped with a floating roof and rim seal system. Gas slugs and products slugs are common in pigging operations. Most inlet diffusers are meant for liquid-use and are not capable of handling the increased flow rates of these slugs. Therefore, normally any gas inlet diffusers will be longer then a liquid inlet diffuser and have graduated slots or perforated plating on.